On this page you can find technical information, reviews, comments on the DVD contents, and more! 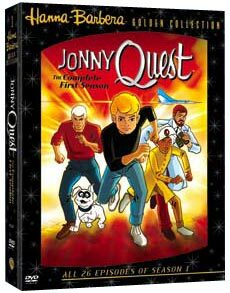 This is your one-stop shop for anything related to the Jonny Quest season 1 (a.k.a. "classic JQ") DVD collection from Warner Brothers. 4 DVDs on a "digipack", folded in a slipcase, Color, run time approx. 676 mins. 4 DVDs in individual DVD cases, in a slipcase, Color, run time approx. 717 mins. including special features. Click on the following button to go to the official Warner Brothers website (www.jonnyquest.com) to see clips and a photo gallery, get downloads, and learn more about the DVD directly from Warner Brothers themselves. Or use the "Buy from Amazon.com" on the navigation bar at the left to order from Amazon.com. A big disappointment to hard-core fans was the fact that the original ending credits were not restored for the collection. Because the DVD set reuses the same end credits for 25 of the 26 episodes, we're presenting the distinct credits for all stories here, as a way to honor the other people who worked on the series. Another issue that irked some fans is the censorship cuts and other apparently random edits made to some episodes. Follow this link for all the details. Follow this link for a look back at the news items we posted as the release date drew nigh. About other DVDs you may have seen for sale.